Clathrate (hydrate) gun hypothesis stirred quite the controversy when it was posed in 2003. It stated that methane hydrates—frozen water cages containing methane gas found below the ocean floor—can melt due to increasing ocean temperatures. According to the hypothesis, this melt can happen in the time span of a human life, dissociating vast amounts of hydrate and releasing methane into the atmosphere. Consequently, this would lead to a runaway process in which the methane released would add to the global budget of greenhouse gases, and further accelerate the warming of the planet. This dramatic hypothesis inspired science fiction and scientists alike, spurring the latter to further investigate the sensitivity of hydrates. 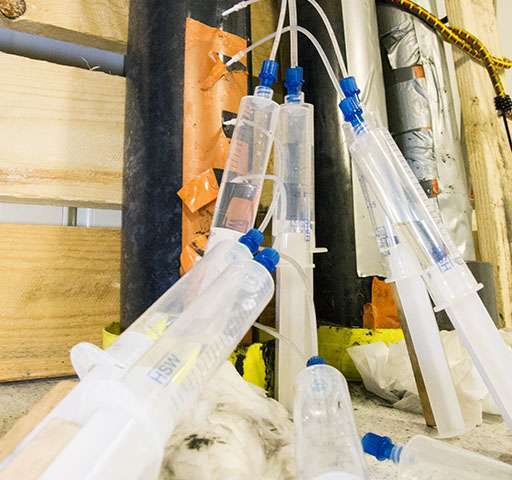 A new study in Nature Communications has found that the hydrate gun hypothesis seems increasingly unlikely, at least for a specific site in the Arctic Ocean that is highly susceptible to warming. 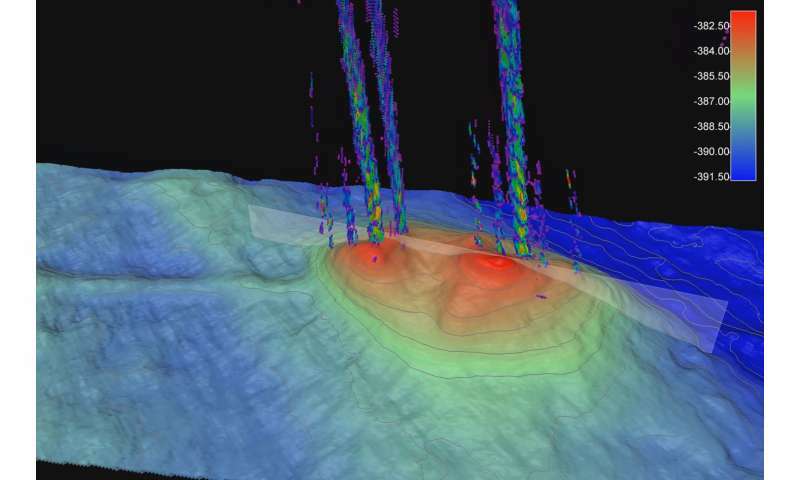 "Short-term temperature warming has limited impact on the gas hydrate stability. We show that warming can significantly affect gas hydrates in the seabed only when ocean temperature is constantly rising for several centuries," says the lead author of the study Dr. Wei-Li Hong of CAGE and currently Geological Survey of Norway. Hong and colleagues reported on an increase of methane flux beneath large mounds of hydrates in an area called Storfjordrenna, in the Barents Sea close to Svalbard. 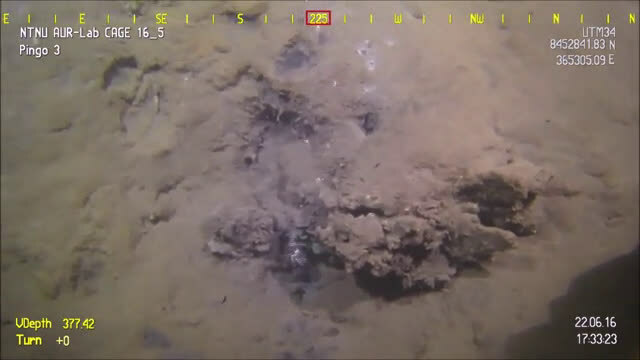 These gas hydrate pingos are all profusely seeping methane. But according to Hong, even though the area is shallow, and potentially susceptible to temperature change, these seeps are not intensifying because of the momentary warming. For the past century, bottom water in the area fluctuated seasonally from 1.8 to 4.6 degrees Celsius. Even though these fluctuations occurred quite often, they only affected gas hydrates that were shallower than 1.6 meters below the sea floor. The hydrates are fed by a methane flow from deeper reservoirs. As this area was glaciated during the last ice age, this gas compacted into a hydrate layer under the pressure and cold temperatures under the ice sheet. Hydrates can be stable in the first 60 meters of sediments. "The results of our study indicate that the immense seeping found in this area is a result of natural state of the system. Understanding how methane interacts with other important geological, chemical and biological processes in the Earth system is essential and should be the emphasis of our scientific community," Hong states. Two really inconclusive studies, whose conclusions don't necessarily follow from their findings, or at least not insofar as the findings are presented in (both of) the articles published here on Porg. Both of them seem to acknowledge that further warming would likely trigger additional release of methane from clathrates, but then go on to say that it is unlikely without actually saying why they claim this to be so, when we clearly live in a warming world. I wonder what is afoot? Is this really shoddy journalism? Really shoddy research? Both? Some kind of denierside-funded pseudoscience?